This is a weird book for a Superman story. The Toyman kidnapped and killed Cat Grant’s son, Adam and now she tries to get revenge on him and Superman has to stop her from killing a formerly harmless member of his rogues gallery. Re-Collection Price: $1.00 from the dollar bin at my local comics shop, Royal Collectables. The story begins with WGBS TV host, Cat Grant, sitting alone in her darkened apartment. The montage on the first page tells us someone passed away, she could have been drinking, she goes into a drawer and and pulls out a gun. We do know, through the newspaper that Cat is reading, that her son, Adam's killer has been captured. She puts the weapon in her purse and begins the long slog to the police station to kill, Winslow Schott the Toyman, who killed her son. Jurgens then flashes back to when she first confronted Superman about finding her son’s killer and Superman warns her about making sure her hate for Schott doesn’t consume her. We then follow Superman’s investigation into the murders where we learn that Adam was not the only victim, each victim came from a troubled home and was clutching a new stuffed animal. Superman has a hunch that it could be the Toyman but it doesn’t fit his usual more mischievous MO. Cut back to the present as Cat Grant enters the police station. She gets around the metal detectors by starting a small fire, which one of the guards blames on the other's pipe smoking. "Faster than a speeding bullet, more powerful than a locomotive, collects more data than the NSA!" Superman zones in on Schott by using his x-ray vision to scan the waterfront, only to find him in an apartment, sitting in an oversized crib like a child, playing with blocks. 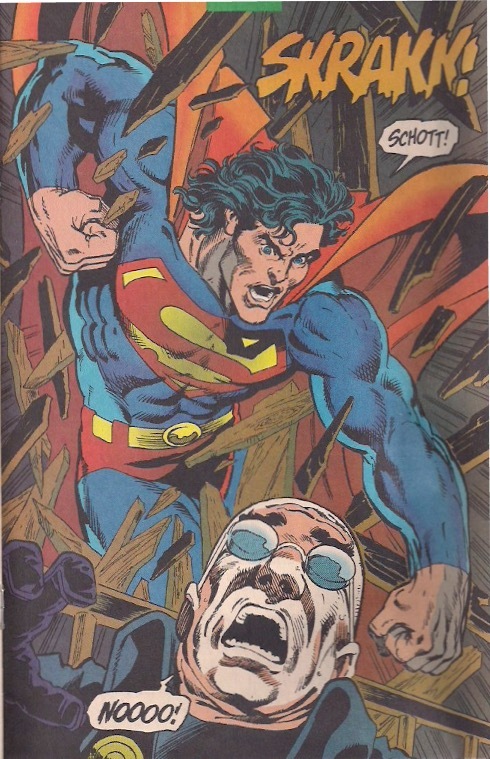 Schott tries to hold Superman off with his toys, but of course, it’s Superman so what did we think would happen? The way Schott is drawn this issue is downright creepy. Back to Grant at Schott’s cell. He tells her that he killed her son to save him from his bad mother, who drank too much and committed adultery. Cat pulls out the gun. Superman captures Schott then back to cell where Cat pulls the trigger and it’s a gag gun. She decided to use a toy gun when she passed the toy store. Was Superman going to let her shoot Toyman or did he use his x-ray vision? Superman appears behind her and tells her that he won’t report her and Cat resolves to begin the process of moving on.. This was a dark book and I could see why it disturbed me as a kid. A guy called the Toyman going around killing kids that he deemed to be from bad homes, while sitting in a giant crib, is pretty disturbing for an 11 year-old. This is especially true since prior to this story most Toyman stories were goofy tails of a guy with weird windup toys. Other than Luthor, Superman’s rogues gallery doesn’t match up with other heroes like Batman or Spider-Man. What I really liked was how Jurgens told the story. He broke from the linear narration and flashed back and forth between Cat going to confront Schott and Superman trying to capture him and then finally in the last panel they are seen together. I also liked the way he used a montage in the first page to catch us up on the story without specifically spelling it out, obviously and homage to the opening scene in Rear Window. Jurgens seeks to tell catch us up on the story just by showing us different snippets of Cat Grant's apartment. For the price, this was an interesting book. Check it out. I've uncovered yet another Grant/Breyfogle Batman comic. This time, Batman takes on Catwoman in Batman #460! See you in seven!